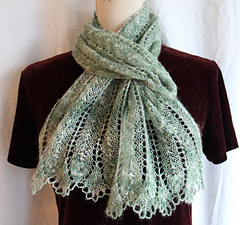 The Miller Maiden’s Scarf is knitted in two parts from the bottom up and grafted at the center. Afterwards, stitches are picked up from the provisional cast on for the crochet chain edging. The pattern assumes that you know how to cast on provisionally, read charts, knit nupps, and graft (Kitchener stitch). Because of the very short lace repeat (2 rows), the scarf can be easily lengthened or shortened. Du hast ja’s Grün so gern. Dann hab’ ich’s Grün erst gern. The Miller Maiden’s Scarf is part of my series The Cloths of Heaven, inspired by some of my favourite poems and poets.